Friday’s event will be live on DAZN, with coverage beginning at 7 p.m. ET / 4 p.m. ET and main card starting at 9 p.m. ET / 6 p.m. ET. 12-round Middleweight Title Bout @ 160 lbs. 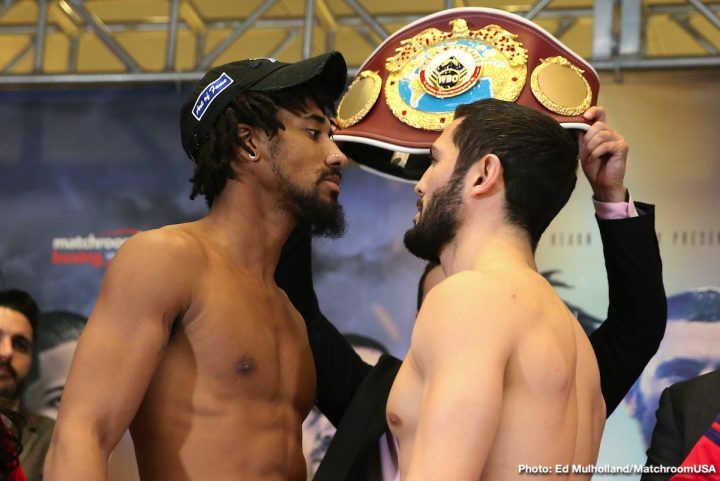 Demetrius Andrade – 159.8 lbs. Artur Akavov – 160.0 lbs. 12-round Super Lightweight Title Bout @ 140 lbs. 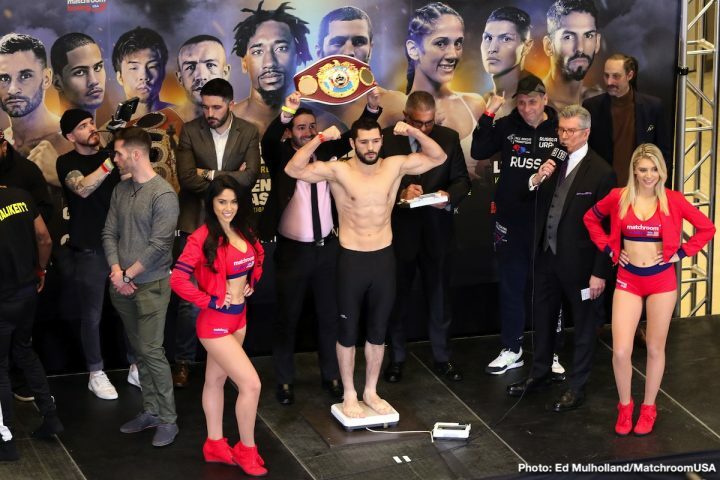 Jorge Linares – 139.4 lbs. Pablo Cesar Cano – 139.6 lbs. 12-round Super Bantamweight Title Bout @ 122 lbs. 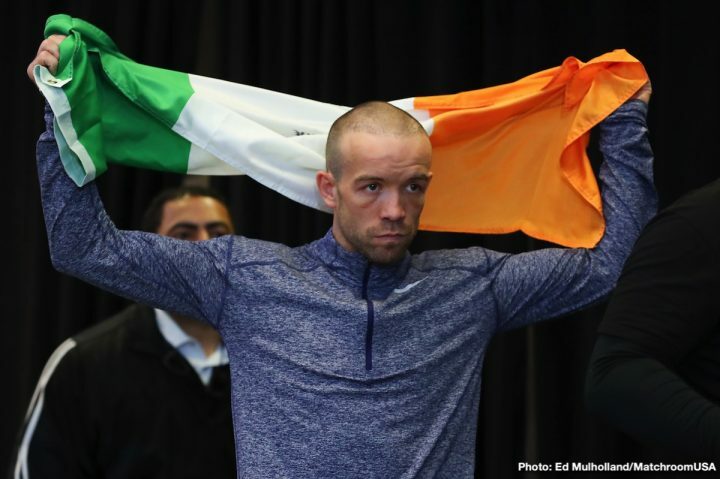 TJ Doheny – 121.8 lbs. 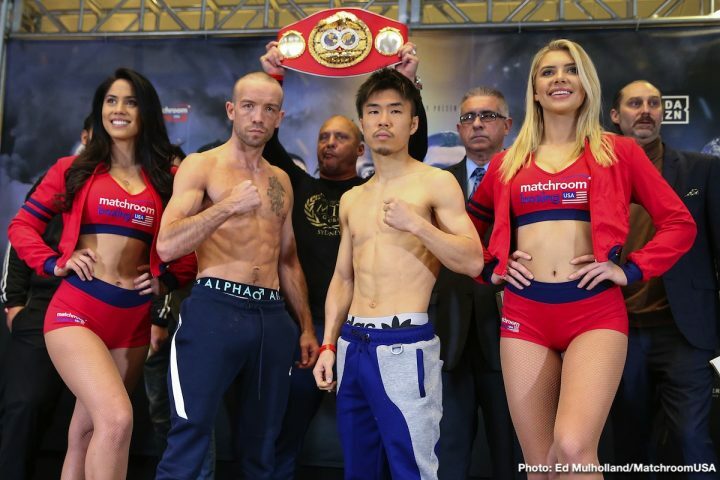 Ryohei Takahashi – 121.8 lbs. 10-round Welterweight Bout @ 140 lbs. 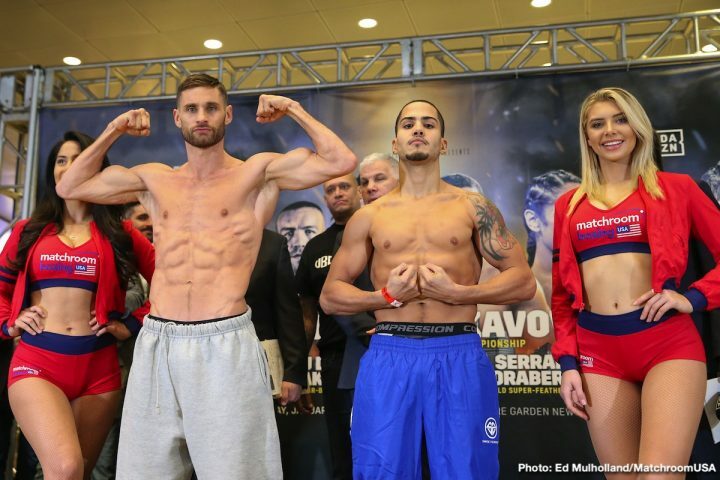 Chris Algieri – 140.0 lbs. Daniel Gonzalez – 139.4 lbs. 10-round Female Super Flyweight Title Bout @ 115 lbs. Amanda Serrano – 114.2 lbs. Eva Voraberger – 114.8 lbs. 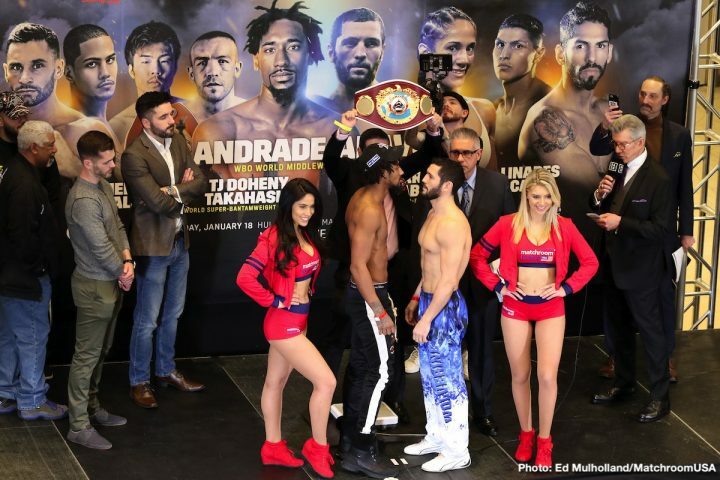 NEW YORK, Jan.16, 2019: At The Dream Hotel on Wednesday afternoon, the boxing world saw a preview of what will prove to be a fully stacked Jan. 18 Matchroom USA fight night at the Hulu Theatre at Madison Square Garden with three title fights on the main card, headlined by undefeated champion Demetrius Andrade defending his WBO World Middleweight Title against dangerous challenger Artur Akavov. The stacked card will also feature Amanda Serrano fighting for the vacant WBO World Female Super Flyweight Title, Chris Algieri making his return to the ring, TJ Doheny making his first defense of the IBF World Super Bantamweight Title, and Jorge Linares looking to retain the WBC International Silver Super Lightweight Title. In a press conference, Friday night’s fighters gathered to discuss their preparations ahead of the big night, which will be broadcasted live on DAZN. “Eddie Hearn is keeping me active and he knows that the more active I am the better the fighter I am. Eddie wants to make a statement, show people that the way it’s done in the UK is how it should be done in the US, he’s young and I am too – we have the same hunger, he wants to be the top promoter and I want to be the top fighter. Knowing I can be one of the leading fighters on DAZN and they are doing a great job all around. “I’m still clearing my path now, everything good in my way stays and everything bad has got to be moved. I’m happy to be back in so fast, I could have had a tune-up fight or even two and not signed up to fight Billy Joe Saunders for the title, but I have been in the game too long and it’s my time to shine now so I am not going to stop. I have been in the game too long and it’s my time to shine now so I am not going to stop. Former WBO Super Lightweight Champion CHRIS AGLIERI (Huntington, LI, 22-3 8KO) weighed in at a ready 140 lbs, while his opponent DANNY “EL GALLO” GONZALEZ (Woodhaven, NY, 17-1-1 7KO) came in at 139.4 lbs. 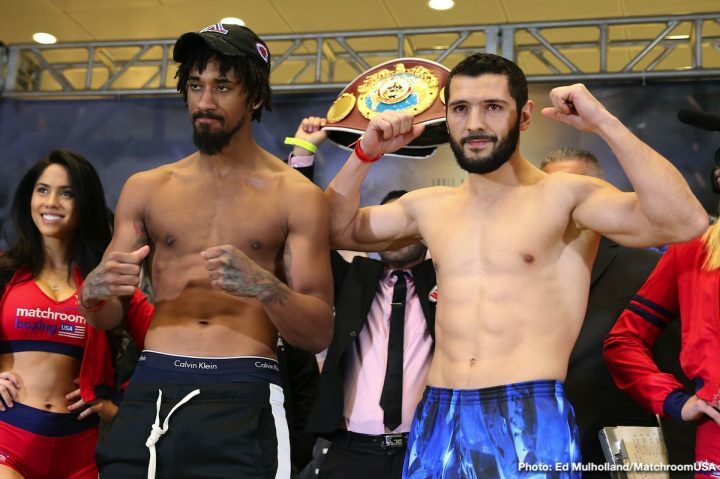 The Star Boxing stablemates will clash for the WBO International Super Lightweight Title. The 10-round contest will take place at the Hulu Theater at Madison Square Garden, New York, New York live on DAZN tomorrow night with the stream beginning at 6:00 PM EST. 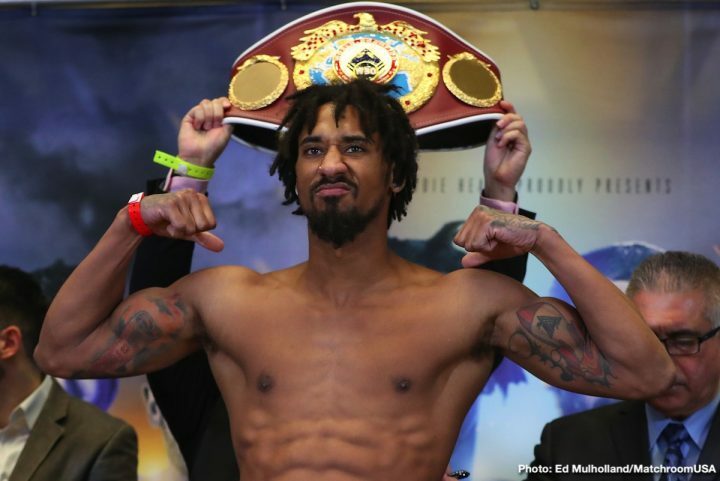 In the main event Demetrius “Boo Boo” will face Artur Akavov in a 12 round WBO Middleweight title bout.